Heart disease is the leading all cause killer of Americans and, with early detection, can be effectively treated. The EBT Heart Scan is the most accurate, most validated technology and the lowest radiation option for heart disease screening. Front Range Preventive Imaging is the only facility in Colorado offering the EBT Heart Scan. 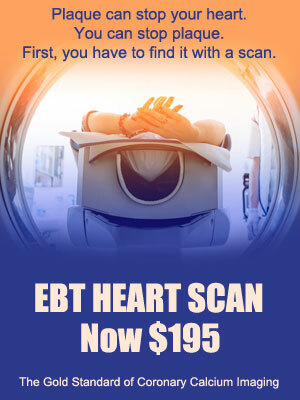 Why an EBT Heart Scan? Simply put, the EBT heart scan is 3 times the accuracy of other heart scans and has 66% less radiation exposure. That’s why it is called “The Gold Standard” of coronary calcium imaging. The EBT is so fast that it can take pictures of your heart in between heart beats. This is partially why the EBT is the most accurate screening technology available for detecting coronary calcium or plaque. 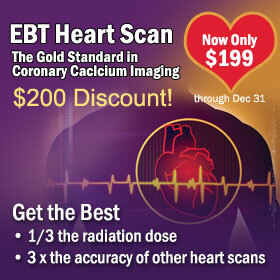 The EBT can detect calcium or plaque in and around your coronary arteries at very early stages. All you do is to lay down on a table, full clothed, hold your breath for a few seconds and you are done. It is really that easy. Pricing specials stated in video are no longer available. Please call Front Range for current specials. The EBT heart scan machine has a weight restriction of less than 300 pounds. If you are a man, age 40 or over, or a woman age 50 or over, without risk factors, we suggest that you get a baseline heart scan. If you have any conventional or non conventional risk factors, it is recommended that you get a baseline heart scan sooner. These risk factors are things like (high blood pressure, high cholesterol, tobacco consumption, diabetes, family history or occupational stresses. Non conventional risk factors are things like sleep apnea or gum disease, to name a few. If you also have a significant exposure to smoking (past or present smoker, passive, etc.) or other known carcinogens, we advise the combination heartscan-lungscan (see lung screening). Lung screening can find potential problems much early than traditional chest x-rays.